and Investment Partnership (TTIP) in the European Parliament, under the patronage of Mr. Paolo De Castro, Member of the European Parliament. As the TTIP negotiations seem to enter a more dynamic cycle, Farm Europe presented 8key elements to be taken into account by EU negotiators in order to maintain a strong stance regarding European agriculture in the negotiation. Overall a trade negotiation with the US is certainly not as such a top-priority for EU agriculture, even though there are many potential offensive interests that could benefit to the EU economy as a whole. Taking into account the potential contribution of the TTIP to the overall EU economy and geopolitical aspects, it is necessary for EU agriculture to get prepared and opt for a rather dynamic approach. 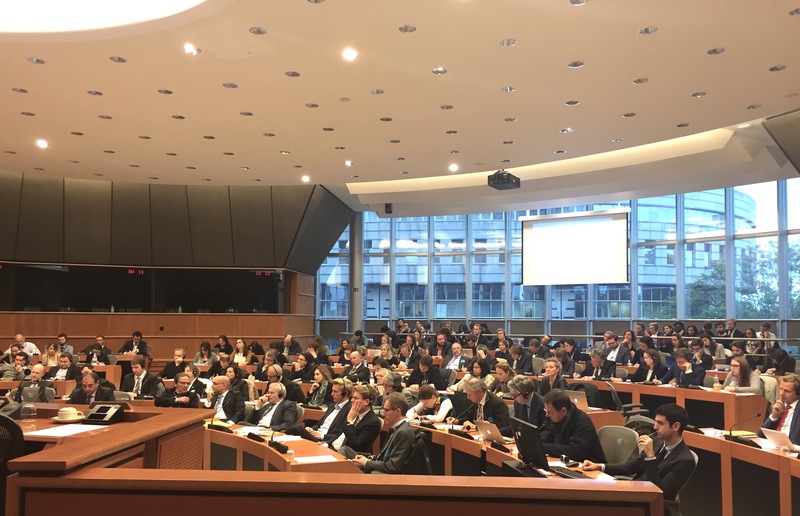 Presenting the report, Joao Pacheco, Senior Fellow at Farm Europe, said: “the EU should not corner its agriculture into a defensive position nor keep a low profile defending only niche products that already have strong market positions in the US market. Geographical indications are indeed important for the EU agri-food sector – especially those playing a genuine role of locomotive on global markets. But market access of agri-food products as a whole should be addressed seriously to find a win-win balance inside the agricultural component of the negotiation as such. Last but not least, several sectors are potentially facing real threats trough this negotiation which should not be underestimated. Red lines should be tackled both via real safeguards introduced in the course of the negotiation and ambitious internal EU policies giving to the affected sectors the tools to adapt and close their competitive gap with US producers”. 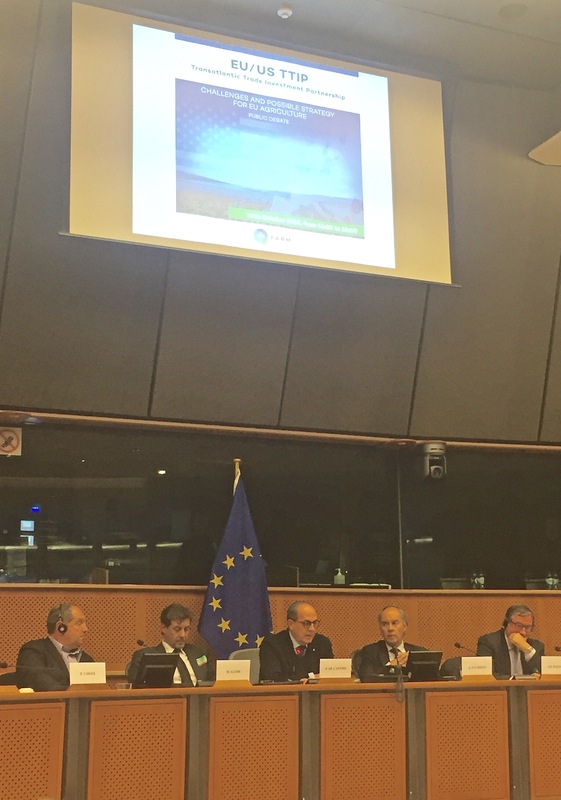 Opening the event, Paolo De Castro said: “TTIP represents a crucial challenge for the European agri-food system. In this sense, in his position approved by large majority last July, the Parliament stressed both the risks and the opportunities for the sector, together with the need to defend our productions and food safety standards. We are confident that, thanks to this steering contribution, the next decisive steps will be finally taken in order to reach a successful agreement able give new impetus to EU agriculture, creating new market opportunities, jobs and employment”. Meat products: It is crucial to negotiate a limited Tariff Rate Quota instead of eliminating tariffs, with a long implementation period to ensure that the sector has enough time to structure itself. The European Commission should present a comprehensive plan to support the sector. Dairy products: The TTIP could lead to free trade in dairy products and to the elimination of regulatory trade barriers. However, additional protection for some EU Geographical Indications should be assessed economically to ensure that its benefits outweigh its costs for other areas of the agricultural negotiation. Grain and Oilseeds: Farm Europe expects that the TTIP could result in the elimination of tariffs in the grains and oilseeds sector. In this case, the EU biofuels policy should enable the EU biodiesel production to expand, rather than serve to constrain it, to allow the EU to compete on an equal footing with the US. The internal distortive mechanisms in force in the Farm Bill should be taken into account by EU negotiators for any concessions such as for wheat, to ensure a level playing field for the EU sector, and specific protections should be maintained for certain highly sensitive products, like rice. Starch and Ethanol: The EU industry needs time, an appropriate regulatory framework and safeguards to meet the competition from the US. Additionally, the costs and benefits of producing biofuels in the EU should be evaluated objectively, and an assessment should be made of its impact on the EU protein deficit, instead of succumbing to prejudice and targeted campaigns. Fruits and Vegetables, Nuts and Olive Oil: Free trade and the elimination of non-tariff barriers could generally be beneficial to these highly diversified sectors, as long as SPS barriers in the US are lifted. Wine and Beer: The EU should be offensive in this sector, building on its renewed competitiveness and concentrating its efforts on eliminating tariffs and non-tariff barriers in the negotiations. Sugar and other Processed Products: The elimination of EU sugar production quotas after 2017 points to a more ambitious EU position for sugar and sugar-containing products over the long term, as this reform will lead to the expansion of more competitive sugar production. Nevertheless, special attention should be paid to specific sugar products and the EU should strive for strict rules of origin. Sanitary and Phytosanitary Issues (SPS): Even excluding hormones and GMOs, other SPS issues can be successfully addressed and a mutually agreed solution can be found. Farm Europe will also continue working on internal aspects of the agricultural policy. The capacity of the EU to adapt its Common Agricultural Policy to the real economic challenges faced by farmers will play a decisive role in the global competitiveness of the EU agri-food sector, thus deciding its ability to remain a key player on global markets.